It's 12:20 in the Sequoia and Kings Canyon National Park, USA right now. 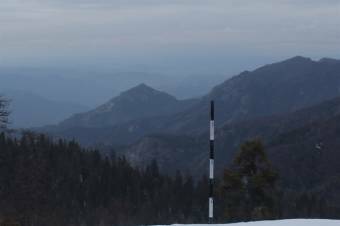 Giant Forest Webcam A panorama view over the Sequoia & Kings Canyon National Park. Mineral King, California: Mineral King - Timber Gap, 5.1 miles away. Three Rivers, California: Kaweah River Cam, 12.3 miles away. Three Rivers, California: Kaweah Kam, 12.3 miles away. Lone Pine, Idaho: SH-28, M.P. 49.2, 36.5 miles away. Lone Pine, California: Mount Whitney, 36.5 miles away. Lone Pine, California: Weathercam, 36.5 miles away. Independence, California: Mount Williamson, 37.1 miles away. Alta Sierra, California: Alta Sierra Hikes, 49.2 miles away.